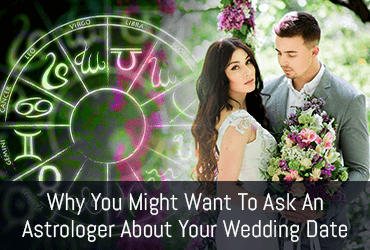 Why You May Need to Ask an Astrologer About Your Wedding Date? How many dates do you remember in your life? It might be hardly three or four. Your mind keeps the “date” in memory according to its significance in life. Mostly these are the birth dates or the dates you met someone or when something of utmost importance happened. Apart from the birth date, you usually give importance to the dates related to love and relationships. There are several dates in the relationship that are worth remembering. The date on which you first met, the date of your first kiss, the date of the wedding proposal, but there is only one date which you can never forget, i.e. your wedding date. Why the Wedding Date is so Important? You already know the answer to this question. It is the date when you officially and spiritually got into a commitment of life with your soulmate. The day when you exchanged vows, embraced new responsibilities, authorized new rights and announced your decision and the love for your soulmate to the world. It is the day after which you share all your happiness and life with someone. You and your partner officially become the married couple and embark on a new journey together from this day. So, the day you got married is the day of supreme significance in your life and that is why you want it to be the most auspicious and the perfect day. Marriage is an auspicious occasion which signifies the unification of two souls. It is not just an event or simply an occasion to say “ I do”; it is about the beginning of a new life. Everyone wants a brilliant start for their marriage and expect this day to be the beginning of happiness and prosperity in your life. According to Astrology, online horoscope or birth chart can reveal the most auspicious time to get married adding to your joy and happiness. If the date is picked according to the natal chart, then it can seal the foundation of a happy and long-lasting marriage without many obstacles. It is not a practice of decades, but the ritual to finalize the wedding date is from ancient times. If you turn the pages of the historical texts, you may see the practice in the South Asina cultures, Twelfth-century Jewish mystics, and Roman astrologers. All believed that this auspicious event must be witnessed only according to the position of stars and in the presence of a sacred deity. This is the reason weddings are often conducted in church or shrine of God. Despite all, if you still feel why you should consult an astrologer for the wedding date then we have put together some reasons which might lead you to change your mind. Your Wedding Horoscope or Love Horoscope may help you to determine the date which is destined for you to tie the sacred bond. A good astrologer may help you to know the hidden possibilities in the relationship and the challenging and difficult times. You may know what the stars want to say to you about your upcoming future in this relationship. An astrologer is able to study the position of stars and check the predictions for the favorable conditions of a wedding. Through a natal chart, they may predict if the planets are showing any changes or are there any possibilities of mishap in the future? And, which date is the most suitable to minimize such difficulties. A good daily horoscope can share the insight over the retrogrades of the planets at the expected wedding time. Not every retrograde is bad or not every forward movement of planets can predict a fruitful time. For example, Mercury retrograde at the time of the wedding date can impact the communication between couples and can cause a communication gap. It may also cause the people traveling for marriage to suffer due to delay in the conveyance and make them late at the wedding event. Similarly, Venus retrograde influence beauty and intimacy. Relationships formed in the period of Venus retrograde may become excessive romantic but lack commitment in the long run. All these impacts and predictions can only be known and analyzed by experienced and expert Astrologers. The placement of the Moon and Venus plays an important role in the wedding. Their positions can predict whether you will have an emotional breakdown after marriage or how good will be your compatibility with the partner or can there be the fulfillment of sexual desires in the marriage. It may reveal the level of stability in the relationship on the basis of the wedding date fixed on the specified date. It is very important to compare the birth chart with the daily love horoscope to get the right date for the wedding. You might know that people born under different zodiac may have different behaviors and choices. Unification of two different zodiacs must be on a fortunate date for a promising future. Marriage is an important decision. To get astrological guidance in deciding the date for this beautiful bond can play a pivotal role. An astrological approach to get the perfect wedding date may only enhance the happiness and joy of the alliance.